The ambitious Cisco Open Network Environment package, introduced at Cisco Live 2012 in San Diego, aims to give cloud providers, service providers and academics comprehensive support for software-based and software-defined networking based on Cisco products. Cisco ONE includes APIs, agents and controllers, and overlay network technologies designed to make each layer of a network – from the transport layer up through the management and orchestration layers – programmable in order to make it adaptable and extensible to changing needs. Cisco says Cisco ONE complements this approach by opening up areas above and below the control and forwarding planes addressed by OpenFlow. This allows customers to program the network using a variety of protocols – not just OpenFlow – and further customize it according to their usage patterns and deployment models. Cisco ONE includes the One Platform Kit (onePK) which provides APIs for developers across Cisco’s routing and switching operating systems: IOS, IOS-XR and NX-OS. Cisco will initially offer the onePK development tool to hook into its ASR-1000 head-end routers and its ISR G2 branch routers, and it will eventually be available across all ASR, ISR G2, and CSR routers and Catalyst and Nexus switches in a phased rollout. A timeline for that rollout was not given. Meanwhile the Cloud Services Router (CSR) was announced earlier this week by the firm. It is a virtual machine loaded up with Cisco’s IOS operating system and routing software that can be deployed in clouds and extend the corporate network’s routing out to those clouds seamlessly from the data center as has been possible to the branch office for years. 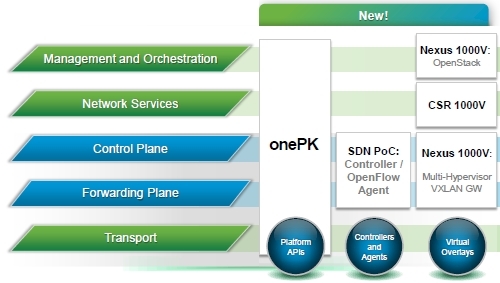 The ONE plan to deliver SDN also includes a number of other elements. Cisco says it is collaborating with various academic and research institutions on OpenFlow, and will deliver proof-of-concept OpenFlow v1.0 agents on the Catalyst 3750-X and 3560-X switches and is leading a number of workgroups at the Open Network Foundation, which steers the OpenFlow effort. Cisco last fall promised to support OpenFlow on its Nexus data centers switches but found in the ensuing months that OpenFlow has less appeal in the data center and more in academia and research, company officials said. Other components of Cisco ONE include its Nexus 1000V virtual switch, which the company says can be used as the basis of virtual overlay networks for multi-tenant cloud deployments. Nexus 1000V now supports OpenStack Quantum and REST APIs for multi-tenant orchestration, open source hypervisors and a VXLAN gateway connecting physical VLAN and virtual networks. VXLAN is a network encapsulation technique with segment identifiers for creating millions of logical networks and for enabling workloads to move across data centers and cloud infrastructures. The networking segments will support multitenant cloud infrastructures that require segmentation for security and compliance, Cisco says. The Nexus 1000v virtual switch, which has been adopted by over 6,000 customers so far, will be the keystone for overlaying virtual networks and making them more programmable, according to the company. The plan calls for Cisco to support the Nexus 1000v virtual switch on Red Hat’s KVM and Citrix Systems’ XenServer hypervisors, in addition to the VMware ESXi and Microsoft Hyper-V hypervisors it already works with. The Nexus 1000v will also get VXLAN gateway support (bridging VLAN-based physical switching with the VXLAN-based virtual overlays with virtual switching) and will be integrated with OpenStack’s Quantum application interface to networks; presumably other cloud fabrics will also be supported at some point, since OpenStack is by no means a dominant cloud controller in terms of installations. The Nexus 1000v will also get REST APIs so it can be programmed with simple web commands – like other systems software available today. The CSR-1000v virtual router will also play a key role in providing programmable services for the network. Cisco ONE is designed to support a variety of deployment model for programmability, including network partitioning, or ‘slicing,’ in universities and research using OpenFlow agents and controllers; network flow management for massively scalable data centers; automated provisioning and programmable overlay networks for the multi-tenancy requirements of cloud providers; programmatic policy and analytics for service providers; and private cloud automation for virtual workloads in enterprises, including desktop virtualization. Beta trials and general availability of the various ONE components is slated for the fourth quarter of this year.